It was that fire, one month after he turned 14, which forged him. And a year later there was the Panic of 1873, an economic collapse resulting from inflation, the leveling of infrastructure and an over-dependence on railroads. Boston was in ruins. But it proved the perfect atmosphere in which to build a great warrior. After ending his formal education at the age of 15, Sullivan traded his physical strength for wages and apprenticed in various jobs before he took an interest in pugilism. Five years after leaving school he essentially fell into prizefighting when he found himself challenged by a man named Jack Scannell during a show at the Dudley Street Opera House. After walking through Scannell with ease, Sullivan dove head-first into professional boxing, despite the fact prizefighting was, at best, tolerated by the authorities, and at worst, illegal. But police and local officials could usually be either tricked or bribed, and when they couldn’t, the contest in question was categorized as a boxing “exhibition,” and not for money or blood. However, in 1876 a Massachusetts case in the Supreme Judicial Court, Commonwealth v. Collberg, ruled that boxing of any kind was now outlawed in the state, the new law proclaiming that “prize-fighting, boxing matches, and encounters of that kind, serve no useful purpose … and are unlawful.” But they served a “useful purpose” for the 20-year-old Sullivan, so he kept finding ways to “mill,” either with gloves or “raw ‘uns,” nothing but knuckle. 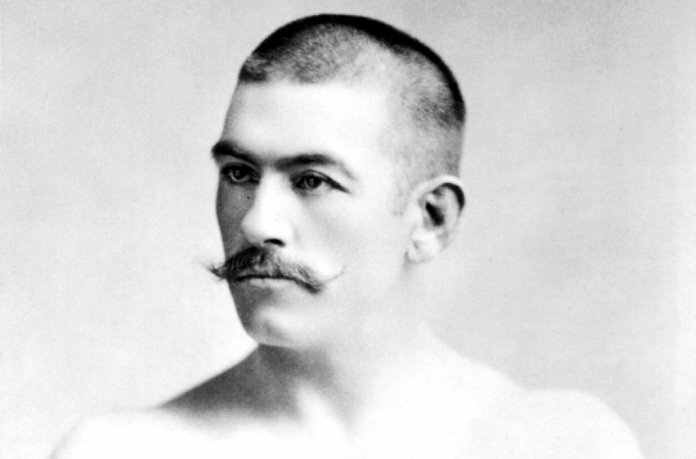 By the end of 1882, Sullivan had faced a number of prominent practitioners in bare-knuckle fighting, such as “Professor” Mike Donovan, Joe Goss, Billy Madden and John Flood, and thus had made a name for himself on the East Coast and in the Midwest. Additionally, Sullivan twice licked “Professor” John Donaldson, a respected Ohio pugilism instructor, both being jailed following their second bout. 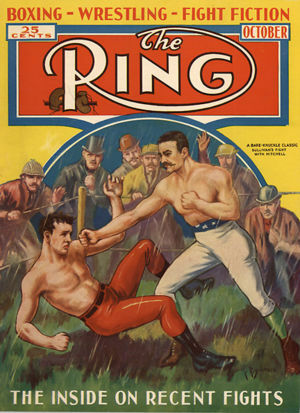 Also aiding Sullivan in his quest for the undisputed heavyweight title of a slightly more legitimate sport was the bare-knuckle championship of America, which he took from Paddy Ryan earlier that year, that bout fought under London Prize Ring Rules, as opposed to the later Queensberry Rules. Richard K. Fox, journalist and editor of the National Police Gazette, and promoter of the Sullivan vs Ryan bout, had been on the search for a man who could defeat Sullivan after having been given the cold shoulder by the notoriously cantankerous John L. in a New York saloon. Fox eventually “discovered” Charlie Mitchell, a 21-year-old Birmingham, U.K. native born to Irish parents, who had already established himself as an outstanding pugilist and boxing instructor. According to a detailed record given by the Boston Herald prior to his arrival in America, Mitchell’s first bout, when he was only 16, was a bare-knuckle match lasting nearly an hour against a fighter named Bob Cunningham. Before long, Mitchell had built up a local reputation and had also seen the inside of a jail cell due to his penchant for bloodletting. 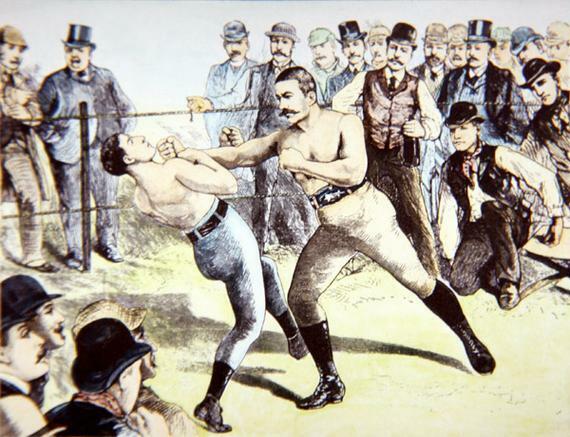 In June of 1881, Mitchell tangled with Jack Burke for the bare-knuckle welterweight championship of England. The bout was ruled a draw after 25 rounds when it became too dark to continue and police intervened, jailing both men and sentencing them to six weeks imprisonment. (Burke would later become famous when in 1893 he fought Andy Bowen for 111 rounds and over seven hours, the longest boxing match on record.) 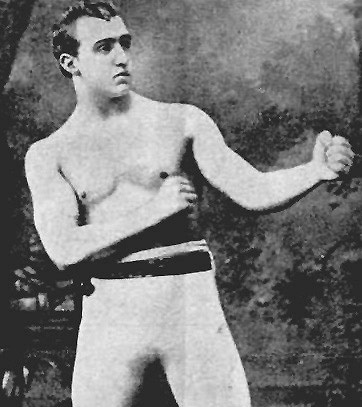 Mitchell then won a welterweight/middleweight tournament in London in 1882, and later that year went on to win a heavyweight tournament promoted by Billy Madden. Following that, Madden had Mitchell participated in a handful of sparring matches and exhibitions before the two set off for the U.S. and an eventual showdown with Sullivan. Madden wanted to test his charge before putting him in with someone of Sullivan’s caliber, and one week after arriving he matched him against Mike Cleary, an experienced Irish hitter, considered the best middleweight on American soil. The New York Herald reported that over 4,000 spectators turned out to watch the set-to. The local police had inspected the fighters’ soft gloves and allowed the bout, but they stopped it when Cleary was decked by a right hand in round three and then bludgeoned for a time after he rose. The win was impressive enough to set up a lucrative Sullivan vs Mitchell clash. A slightly chubby Sullivan entered the ring first at 9:15 p.m., striding through the ropes and sitting in his corner, resting his sinewy arms on the ropes of the 24-foot ring. Mitchell then entered with a silk shirt, colorful socks and a white and blue sash tied to his white drawers. Mitchell tipped the scales at approximately 154 pounds, with reports indicating that Sullivan had a 40 pound advantage, in addition to being markedly taller. 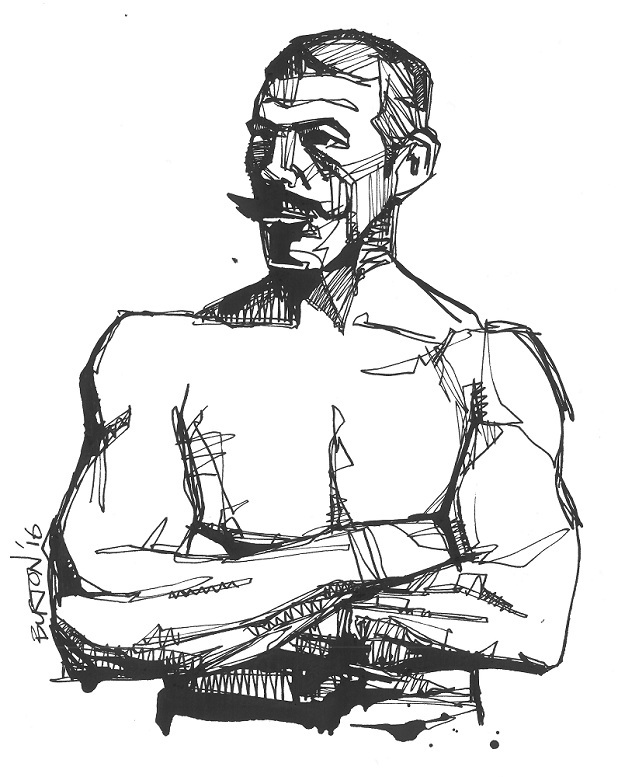 Sullivan wrestled Mitchell to the canvas in his own corner, then, in a show of intimidation, stood over him as the smaller man rose. When action resumed, again Mitchell found himself almost bowled over by Sullivan’s rushes and momentum, and it appeared the man from Boston had the fight in his control, until Mitchell again showed deft defense by pivoting away from Sullivan’s next lurch and decking the big man with a right hand. An astonished Sullivan rose, then resumed attacking. There was no escape for Mitchell, so he elected to stand and trade until the bell sounded to end the round, in which Mitchell had shown the world that Sullivan was human. And while the bigger man huffed between rounds, Mitchell appeared relaxed and fresh as he toweled off in his corner. 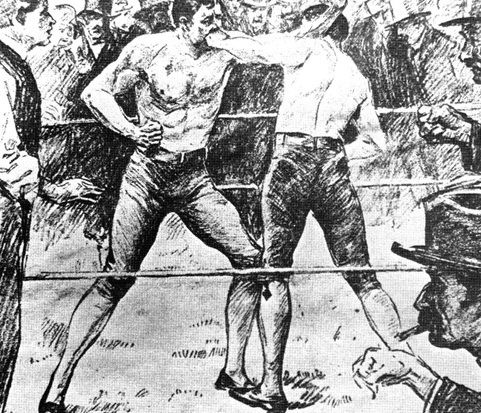 Sullivan dominated the smaller man in the second and The Times reported that Mitchell was knocked over the ropes and down in the final minute, though he was saved from actually hitting the floor by his corner. Round three was more of the same, The Times reporting that Mitchell was decked on four occasions, while The Sun tallied six knockdowns. Whatever the case, Sullivan went for the finish and the police soon stepped in to halt matters. The size and class of “The Boston Strong Boy” had carried the day while Mitchell was a battered man.